Georgia Dunn Studio: The harmony of the season! Diet coke and ham! The harmony of the season! Diet coke and ham! We've spent the last few days relaxing after Christmas, and it's been really nice. Ryan has this week off, so we've just been taking it easy. Enjoying new books and toys, living off leftovers and diet pop. It's the peace and harmony of the season, plus green bean casserole. 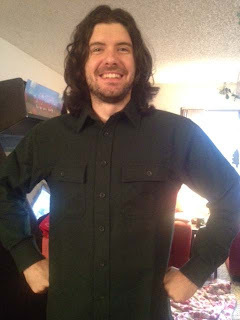 Having Ryan home is really the best part of the holiday for me, even if he won't quit directing his new remote control helicopter to hover over my shoulder and follow me around the apartment. Christmas morning was lovely, we couldn't have asked for a nicer newlywed yuletide. Many thanks to our wonderful family and friends, and for each other. Christmas morning picture in pjs. Ryan was so excited to finally get this poster. (He put it on our wedding registry earlier this year). When Ryan and I were first dating, we were often on the phone or instant messenger until 3 or 4 in the morning. One night as we were saying goodbye late once again, Ryan apologized for keeping me up and I told him, "Don't be silly. There's a Dr. Seuss quote about this kind of thing, when you find someone you're really crazy about you don't sleep anyway." Ryan said that sounded right, and googled it, and came back with the exact quote. The quote itself blamed being in love, which at the time, neither of us had admitted to yet, but we both agreed after reading it verbatim that it was perfect. And that's how we told each other we were in love, even though we waited to actually say the words until a few weeks later when we were together in one spot again. So knowing that story, you'll understand why I was so thrilled that Ryan had this sign made in Oregon for me this Christmas. Our favorite Dr. Seuss quote. 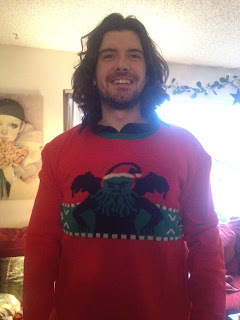 And the Cthulhu Christmas sweater our friend Stephen got him! OMG YOU GUYS, UNCLE DEADLY! Who's Uncle Deadly? That's Uncle Deadly! (Outside our fairy door). We got the cats a skunk and a bird toy that make chirping sounds. Here's looking at you, Skunk! My new Animal Muppet figurine visits the Nativity. I'll explain the story behind that Narwhal soon. My Facebook and Twitter pals know what's behind that, but I haven't mentioned it on the blog yet. It's worth its own post. Uncle Deadly and his ghost friends join the Wise Men! I've got to get back to my plate (that pile of ham isn't going to eat itself!) However, in the downtime of holiday relaxation I have been sketching some Gnome paper dolls and I hope to share them shortly. I plan on painting the Noah's Ark sketch as well sometime this week! 2012 Resolutions and 2011 Highlights! Noah's Ark Sketch is ready for paint! Yes, Georgia, there is a Santa Claus.